When asked what is the hearty way to announce that you are rocking happy? There are many ways, a people experiencing those feeling always make it a point to coalesce surprise elements and regular elements to make it more memorable. People who wish to observe their special day amidst loved ones can always seek this magnet because it offers ample of space for expressing special day with a graced composure. 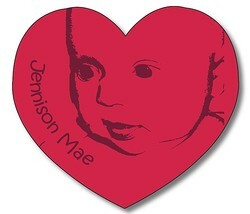 It requires something as low as $0.09 to customize these magnets (only and only if they are ordered bulk). Product Size 2.37 in. x 2.12 in.